Motorized fishing bancas with fishing gears awarded to 53 fishermen of San Antonio, Basey, Samar on 26 March 2014 by Gina Lopez, managing director of ABS-CBN Sagip Kapamilya Foundation. BASEY,Samar – A total of 53 fishermen who are members of the San Antonio Fisherfolks Association, this town, were given motorized fishing bancas with fishing gears to restore their livelihood which they lost to supertyphoon Yolanda. The motorized fishing bancas were awarded in simple rites at the shoreline of Barangay San Antonio. Rev. Fr. Rex M. Ibañez, priest In-charge of San Antonio de Padua Mission Center, blessed the motorized fishing bancas and fishing gears. The fisherfolks were organized for a “bayanihan” system in boat building as well as in the fabrication of their fishing gears. 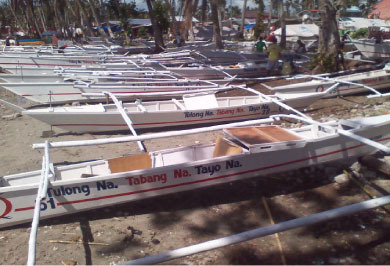 On the other hand, ABS-CBN Sagip Kapamilya provided the design and specifications of the motorized fishing banca and all pre-cut boat materials, fishing gear supplies and engines. Boat makers of Rouvia Company from Mariveles, Bataan conducted hands-on training on boat building among the skilled fisherfolks. Bamboo for outriggers and floats were the counterpart of the local government. The fisherfolks were then led to recite their pledge to engage in lawful fishing activities to support their families and never to engage in dynamite fishing and other illegal fishing methods by pledge to engage in lawful fishing activities to support their families and never to engage in dynamite fishing and other illegal fishing methods by Regina “Gina” Paz Lopez, managing director of ABS-CBN Sagip Kapamilya Foundation. The event was attended by the bigwigs of ABS-CBN, Norie Garcia, program director of Bantay Kalikasan, Arch. Rozanno Rosal, FUAP, national president of the United Architects of the Philippines , John Brown from Australia and Mayor Igmedio Junji Ponferrada. The motorized fishing bancas simultaneously went offshore to catch fish within the San Pedro Bay area fronting the barangay. About an hour after the formal launching, fisherman Eduardo Dacer brought to the convent of the San Antonio de Padua Mission Center the first catch of over a kilo of fresh fishes which he presented to lawyer Rey Delgado, ABS-CBN Sagip Kapamilya project coordinator for Samar. The fresh catch elated Lopez and her companions who witnessed the fruition of their livelihood assistance. The livelihood project for the fisherfolks was the first response to the devastated people of San Antonio who were hardly hit by the super typhoon Yolanda which devastated the entire barangay and all forms of livelihood and economic activities.